Size: 5.5" x 2.9" x 0.7"
We wrote the year 1980, when Texas Instruments discovered the lower labour costs of Taiwan, R.O.C. compared to US or Europe. Till the early 80s most calculators from Texas Instruments were produced either in US or Italy and some early LCD models like the TI-1768 even in Japan. 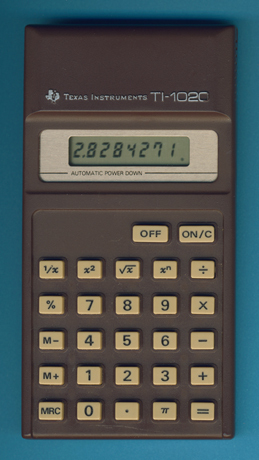 This TI-1020 and its sibling TI-1015 marked an important milestones in contract manufacturing of Texas Instruments calculators, within 2 years the TI-15, TI-18, TI-21, and TI-501 were introduced. The electronic inside the TI-1020 is very unusual for a Texas Instruments calculator - a chip manufactured by competitor Sharp. The designation TI-1020 forces this calculator to the Basic section, actually it features the xn-function not found on some scientific calculators! Texas Instruments changed in 1981 the color of the housing of both the TI-1015 and TI-1020 from brown to an off-white tone. Comment: Between December 2001 and March 2010 the Date of Introduction of the TI-1015 and TI-1020 was listed on this webpage with 1982. We received this TI-1020 early in 2010 and had to correct it to 1980.